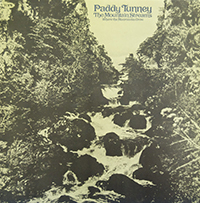 Paddy Tunney established himself as that rare thing a singer really in a class of his own. One of Paddy`s peculiarities is that he chooses a high proportion of songs that are hexatonic or pentatonic. ‘ln the present instance. these â€˜gappedâ€˜ scales. along with the decorated styles of his singing, produce a homogeneity of character which alone would make this a record for the connoisseur of traditional singing.’ Recorded in London in 1975 The Mountain Streams Where The Moorcocks Crow is a splendid collection of songs and ballads from Paddy’s large repertoire.